As the success of Pebble’s Kickstarter project shows, there’s a lot of people out there interested in a smart watch that will work as an extension of their smartphone. As of May 3, the Pebble has attracted more than $8.2 million in crowd-sourced funding (the most successful Kickstarter project by a mile) and has 15 days left before collecting the cash that’s been promised by wide-eyed gadget lovers. But those who don’t want to wait around for Pebble to be commercially manufactured and pushed to the market might have an alternative. Motorola Mobility’s Motoactv device can pair with any Android smartphone, and provides extra features to Motorola phones. A little bit larger than a post-it note and as thick as a pencil, this device can be comfortably worn on your wrist. Motorola separately sells a wrist band and arm band for the device, which comes with a clip attachment in the box. Marketed as a fitness tracking tool, the little device packs a lot of features – GPS tracking, a touchscreen, music playing app, workout tracker, notifications display, Bluetooth connectivity, and of course, a clock. The Motoactv device from every side. Motorola says that all Android users will be able to take calls on the Motoactv, but only Motorola device users will be able to pass on notifications from their smartphone. But using my Samsung-made Google Nexus S, I was able to install the Motoactv app from Google Play (formerly Android Market) and get the notifications working fine. Making use of an internal GPS sensor and motion sensor, Motoactv can keep track of your workouts by time, distance travelled, average speed, and level of intensity. The device can also be fed data from other bio-feedback devices like heart rate monitors, but I didn’t toy with any of those features. I was surprised by the accuracy of the fitness information. I didn’t think the motion detection would track me properly just by having the device strapped to my arm, but I was proven wrong. Even when running on the treadmill, the Motoactv distance travelled and calories burned information corresponded to what was on the treadmill screen. A user just has to enter their age and weight to get this information tracked properly. Using the MotoCast desktop client or your smartphone app, you can sync your workout data to Motorola’s Motoactv online portal that combines fitness tracking and planning tools with social features. The background images of this site also feature attractive models displaying glistening biceps as they exercise in an outdoors area. I can see the appeal of this for someone who might be more intensely training towards a specific goal. There’s analytics provided on whether you’re improving, and you can view your workouts on a graph based on distance, duration, or calories burned. You can even dig into individual workouts and display a map of the route you ran, and a line graph showing the level of intensity throughout the entire workout period. Brian Jackson is the Associate Editor at ITBusiness.ca. There are profiles to track running (outdoors or on a treadmill), walking, elliptical machine, step machine, and cycling. But the cycling indoors profile can’t be used for a spinning class or stationary bike without connecting to an additional heart rate sensor. Motorla does sell a bike mount for outdoor cyclists. One well executed feature is the ability to shake the device during a workout to have it give an audible run-down of your stats. It’s easy enough to load music onto your device by connecting it to your computer and using it like a USB disk drive. On the device, songs are organized by artist, song title, genre, or playlist. There’s also options for Podcasts and FM radio. I found myself wanting a shuffle all songs feature, but it’s not available. Fiddling around with the small screen to play the music I wanted was annoying, especially while trying to keep up with the treadmill. You can set music to play automatically once you start a workout, but you can’t control what music is played by this feature. Another gimmick is a feature that tracks your intensity levels against the music playing, and then recommends a playlist of songs that motivate you. I never used this feature, because I work out at the same intensity whether I’m listening to heavy metal or a podcast of This American Life. It’d be nice if the Motoactv could just stream music from your smartphone, where you have more storage space and an already organized music collection. Reading text messages off the small screen is no problem as the resolution is quite good and the text is easy to see. But you’ll have to manually navigate to the notifications area on the menu to see incoming messages – there’s no pop-up alert in the top task bar like you’d expect on your smartphone. Accepting calls also works fine and didn’t make any perceptible difference in the quality of the call. You can even use a Bluetooth headset with Motoactv – which means you’re relaying your call from your smartphone by Bluetooth to the Motoactv, and then again from that device to a wireless headset. If the device is unused for several days, Motoactv starts posting to my Facebook account about how lazy I am. When Motoactv detects that I’ve suddenly stopped dead in the middle of my jog and have lain motionless for a full two minutes, it calls an emergency number to alert them that I’m suffering a heart attack. If I miss a planned workout, I should be punished by having to listen to a Nickelback song the next time I want to play music on the device. The Motoactv is quite a multi-functional device for its size and weight. The accuracy of its tracking and the various profiles it offers for workouts make it truly useful for working your way towards a fitness goal. 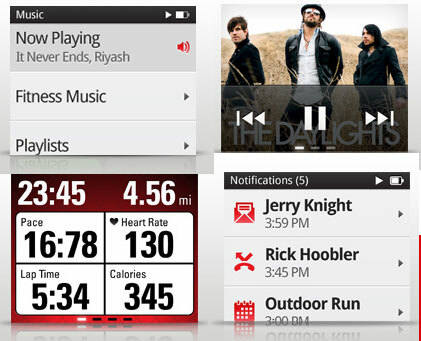 The music playing feature could be refined a bit better, but it serves its purpose for the length of a workout. The device reliably stays connected to your smartphone after being paired for the first time, and passes on calls and notifications consistently. If you think a smart watch will make your tech life better, then this is a good option. It’s available on the market now, and its connected to a hub that Motorola will likely want to keep servicing. One software update has already been issued for the device, adding more workout profiles for activities like basketball and martial arts. Keep in mind the device is only compatible with Android devices.